To Cite: Kamani H, Bazrafshan E, Ghanbari Ghozikali M, Askari M, Ameri R. Photocatalyst Decolorization of C. I. Sulphur Red 14 From Aqueous Solution by UV Irradiation in the Presence of ZnO Nanopowder, Health Scope. 2015 ; 4(2):e22248. doi: 10.17795/jhealthscope-22248. Background: Industrial dyestuffs are the main sources of the discharge of dye pollutants into the environment, which are hardly degradable in the conventional biological treatment plants. Therefore, finding an effective method of treatment is urgent for color removal from dye-contaminated effluents. Objectives: In the present study, the photocatalytic degradation of C.I. Sulphur Red 14 was studied by using UV/ZnO process. Materials and Methods: In this work, ZnO catalyst and mercury lamp (UV-C, 254 nm) have been applied for removal of the C.I. Sulphur Red 14 dye from aqueous environments. The influence of various parameters such as the amount of ZnO, initial dye concentration, pH level, and H2O2 presence were also examined. Results: The results showed that the optimum catalyst dose was found to be 50 mg/L. The maximum rate of decolorization was obtained in acidic condition at pH 5 and the initial dye concentration of 10 mg/L. Photodegradation of C.I. Sulphur Red 14 increased by addition of proper dose of hydrogen peroxide. Mineralization of the dye was also investigated as Chemical Oxygen Demand (COD) measurements showed increase in the COD removal with increase in decolorization rate. Conclusions: The UV/ZnO system has been found an effective process with 90.2% COD removal and 95.6% dye removal after 50 minutes treatment. Various industries such as paper, plastics, food, cosmetics, and textile use considerable volume of water, chemicals, and dyes in order to color their products. Consequently, they generate a significant amount of dye-contaminated effluents (1-3). Dye removal from wastewater has been seriously targeted in the last years, not only because of its potential toxicity to some organisms, including aquatic animals but also due to their aesthetical problems in receiver waters (4). Each of the methods for treatment of dye-containing wastewater has specific advantages and disadvantages. Physical processes are generally non-destructive, and further treatment is necessary. Chemical treatment by chlorine or ozone is effective for color removal, but they are not cost-effective (as a result of their high dosages). Biological treatment methods are usually inefficient due to non-biodegradable organic compounds and other hazardous chemicals into the effluents. 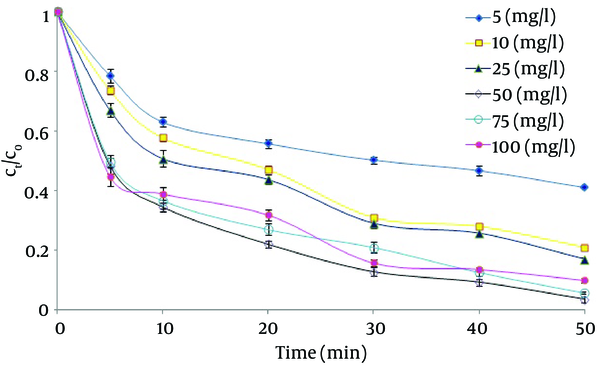 The heterogeneous photocatalysis in the presence of UV radiation has been found an attractive advanced oxidation process for degradation of azo reactive dyes (5, 6). Recently, various advanced oxidation processes (AOP) such as ozonation, peroxone, Fenton, photo-Fenton, UV/O3, UV/H2O2, UV/TiO2, and UV/ZnO have been extensively used for mineralization of many pollutants in aqueous solution (7-10). Among them, TiO2 or ZnO nanoparticles are used as effective, inexpensive, and nontoxic heterogeneous photocatalysis for the degradation of a wide range of toxic and bio-resistant compounds and synthetic dyes into H2O and CO2, without generating any harmful by-products (8). Also, owning to similar photodegradation mechanism, ZnO nanopowder is a suitable alternative to TiO2 (11). Also, ZnO nanopowder is used in various wastewater treatment such as pulp mill bleaching wastewater treatment (12, 13) and used for degradation of 2-phenyphenol and phenol in the photocatalytic degradation system (14). The principal objective of the present study is to evaluate photocatalytic degradation of C.I. Sulphur Red 14, in the presence of ZnO nanopowder by UV-C light under various conditions. In this regard, the effect of several operating parameters such as pH level, the amount of nanocatalyst, and the initial dye concentration were examined. The influence of H2O2 addition for enhancing the decolorization of synthetic dye-containing wastewater was studied too. C.I. Sulphur Red 14 (purchased from Alvan Sabet Co.) was used without further purification. Its structure and characteristics are given in Table 1. Diameter, specific surface area, and band-gap energy of ZnO (purchased from FLUKA) were 14 nm, 10 m2/g, and 2.92 eV, respectively. The pH of the solution was adjusted with NaOH or HCl solution from Merck. Deionized and double distilled water was used throughout this study. Reagents used for COD measurement such as potassium dichromate, silver sulfate, mercuric sulfate, ferrous ammonium sulfate, sulfuric acid, and Ferroin indicator were obtained from Merck. H2O2 (30%, Merck) was used for UV/ZnO/H2O2/ system. Where, DDP (100) is the degradation percentage of the reactor, C1 is the initial concentration of dye (mg/L), C2 is the concentration of dye (mg/L) after reaction for (t) time. In this study, for determination of optimum pH and ZnO dose, 30 and 36 samples were used, respectively. Also, the number of samples for the evaluation of dye concentration effect, H2O2 addition, and evaluation of COD removal in UV/ZnO process under optimized conditions were 24, 20, and 7 samples, respectively, when each test is replicated three times. 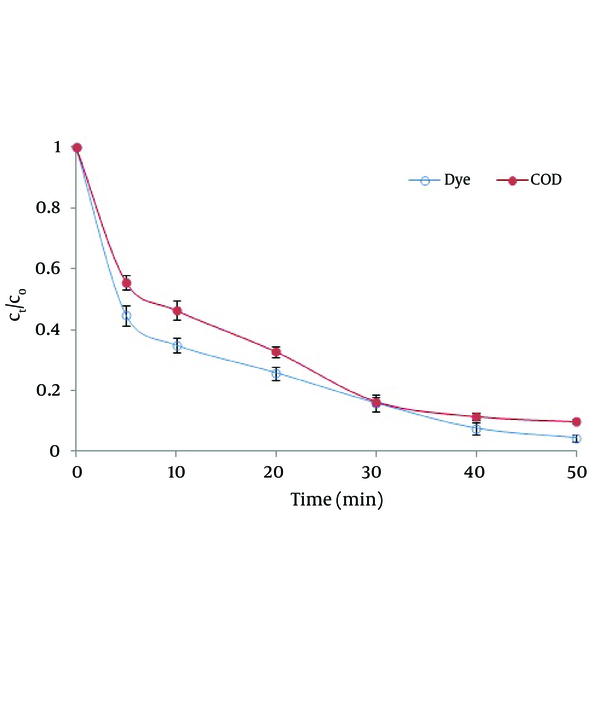 Solution pH is an important parameter that influences photodegradation efficiency of dye. 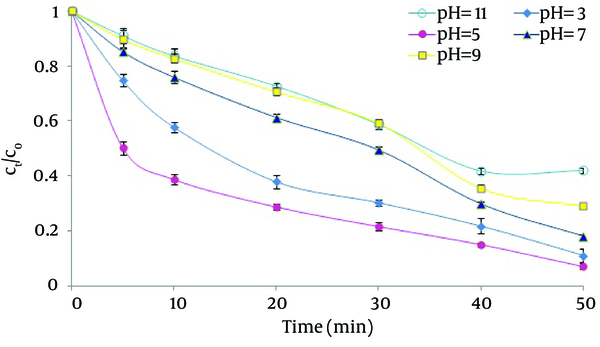 Therefore, the effect of pH on the dye degradation was assessed at different ranges from 3 to 11 for constant dye concentration (10 mg/L) and catalyst dose (75 mg/L). Figure 1 shows the effect of initial pH on decolorization efficiency of C.I. Sulphur Red 14. The results showed that the decolorization efficiency increased with decrease in pH. As shown in Figure 1, pH 5 is found to be more favorable for decolorization. The obtained result from our study was in agreement with other studies for decolorization of azo dyes (12, 15-17). The interpretation of pH effects on the efficiency of the photocatalytic degradation process is a very difficult task since it has multiple roles. Because of the amphoteric nature of the most metal oxide surface, pH could easily affect the surface-charge properties of the semiconductor particles. On the other hand, pH could influence dye dissociation and OH radical formation (18). The experimental results revealed decolorization rate for the C.I. Sulphur Red 14 increased with the decrease in reaction pH and highest efficiency was observed at pH 5. These findings may be related to the interactions between the dye anions and negative charged in the catalyst surface leading to strong adsorption on the catalyst surface. [C.I. Sulphur Red 14] 0 = 10 mg/L; [ZnO] = 75 mg /L. Figure 2 shows the decolorization efficiency at different concentrations of ZnO (5, 10, 25, 50, 75, and 100 mg/L) at pH 5. Experiment results indicate a trend of reduced removal with increasing ZnO concentration up to 50 mg/L. 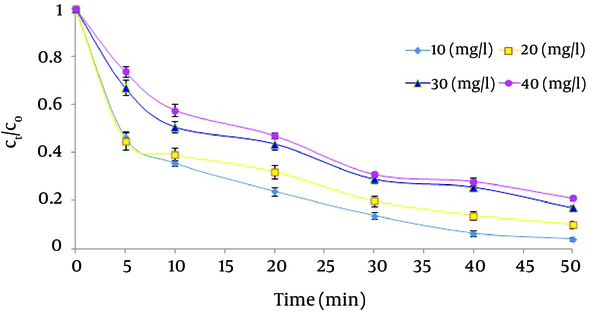 Decolorization efficiency decreased with Increasing of ZnO nanopowder from 50 to 100 mg/L. This observation can be explained by the increase in accessibility of active sites on the ZnO surface through increasing in the amount of catalyst. On the other hand, at higher catalyst loadings (above the limiting value), and accumulation of ZnO particles the number of surface active sites decreases and the turbidity of the suspension and light scattering of ZnO particles increase as a result of decrease in the passage of light through the suspension (11, 19). Therefore, the ZnO dose of 50 mg/L was performed for decolorization of C.I. Sulphur Red 14, for further studies. [C.I. Sulphur Red 14] C0 = concentration of dye at initial time = 10 mg/L; pH 5. Although industrial wastewaters often contain different concentrations of dye, the majority of the studies on photocatalytic decolonization have been performed at specific range of initial concentration. Therefore, it is worthwhile to study the influence of initial concentration of dye on decolorization efficiency. The influence of various initial C.I. Sulphur Red 14 dye concentrations on photocatalytic decolorization by UV/ZnO process at optimal conditions obtained from pervious stages, (pH 5, [ZnO] = 50 mg/L) carried out by changing the initial concentrations of dye from 10 - 40 mg/L (Figure 3). The results showed that an increase in initial dye concentration from 10 to 100 mg/L decreases the C.I. Sulphur Red 14 decolorization from 96% to 62.2% after 50 minutes treatment. Likely explanations are given by other studies (4, 20). The presumed reason is that when initial dye concentration increases, more and more dye concentration is adsorbed on the ZnO surface. Therefore, the generation of hydroxyl radicals will be reduced, which consequently lowers the catalytic activity. In addition, When the initial dye concentration increases, (due to the photons get intercepted before they can receive the ZnO surface) the absorption of photons by the ZnO decreases, and the decolorization efficiency decreases too (21-23). [ZnO] = 50 mg l/L; pH 5. Above 100 mg/L H2O2, the decolorization efficiency decreases due to inhibition of H2O2 via reaction of excess H2O2 with OH (Equations 5 and 6). [C.I. Sulphur Red 14] 0 = 10mg/L; [ZnO] = 50 mg/L; pH 5. Since reduction of COD reveals the amount of degradation rate of an organic materials, its reduction was investigated under optimized conditions obtained from pervious stages (pH 5, [ZnO] = 50 mg/L, dye = 10 mg/L). Figure 5 presents the color and COD removal rate as a function of UV/ZnO process at an initial C.I. Sulphur Red 14 concentration of 10 mg/L, representing increase in COD reduction, accompany with increase in the color removal. As shown in Figure 5, the decolorization efficiency in UV/ZnO process for time reactions of 5, 10, 20, 30, 40, and 50 minutes in the optimized conditions were 55.3%, 65.2%, 74.3%, 84.2%, 92.5%, and 95.6%, respectively, representing a trend of increased decolorization efficiency by increasing the time reaction. The COD reduction efficiency for the corresponding time reaction of UV/ZnO process were 24.4%, 36.7%, 46.3%, 60.6%, 88.5%, and 90.2%, respectively, indicating a similar reduction trend. However, the rate of change in COD was significantly higher than that for dye. These findings show that decolorization efficiency in the initial time of reaction had no significant influence on COD removal efficiency. A possible reason for this result would be the greater ability of UV/ZnO process for degradation of color than for their organic intermediates; thus, in the initial time of reaction, more organic intermediates were generated from degradation of dye and accumulated in the reactor that contributed to the COD measurement. In the present study, the photocatalyst decolorization of C.I. Sulphur Red 14 by UV irradiation in the presence of ZnO nanopowder was studied. The results confirm that simultaneous presence of the catalyst and light is essential for the photodegradation of organic compounds in water. It was found that the rate of dye degradation is significantly affected by the pH, the initial dye concentration, and catalyst concentration. 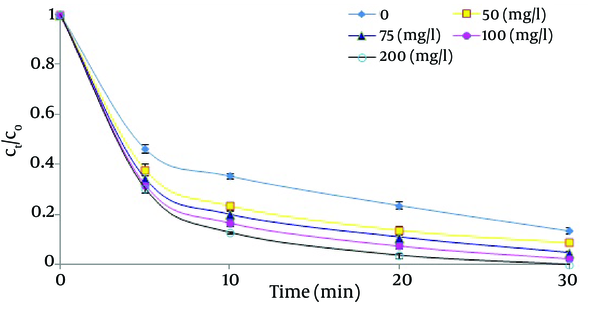 The results indicated that optimal loading of ZnO was 50 mg/L, with the dye concentration of 10 mg/L and pH 5. The results show that the rate of decolorization increases as the catalyst dose increases up to an optimum loading. But above that, any increase in catalyst dose had no effect. Also, H2O2 was proved to be useful for improvement in the catalytic degradation of dye-containing solutions in the UV/ZnO/H2O2 process as it significantly accelerates dye degradation and decreases the required time of reaction compared to UV/ZnO process alone. The authors are grateful to Zahedan University of Medical Sciences for providing financial and technical support. Authors’ Contributions: Conceived and designed the experiments: Hossein Kamani, Reza Ameri; Performed the experiments: Mohammad Ghanbari Ghozikali, Hossein Kamani; Analyzed the data: Edris Bazrafshan; Contributed reagents/materials/analysis: Majid Askari; Wrote the manuscript: Hossein Kamani, Reza Ameri. Funding/Support: This study was supported by the Deputy of Research and School of Public Health, Zahedan University of Medical Sciences.